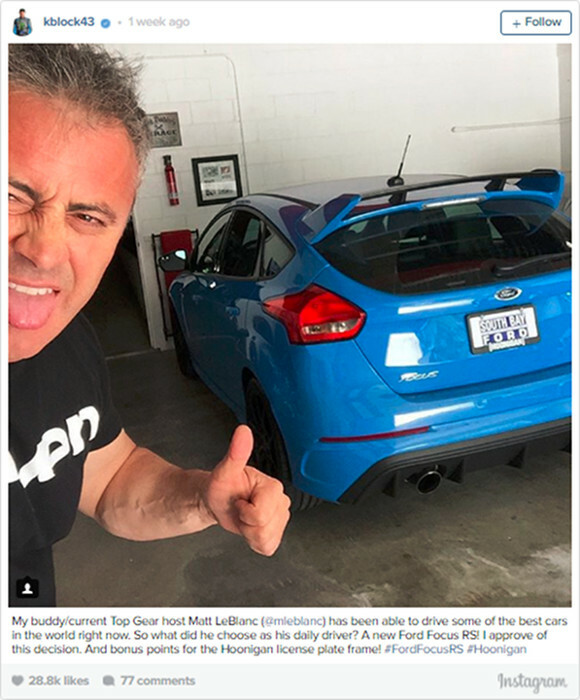 Top Gear host Matt LeBlanc just got a fresh set of wheels, but his new whip isn’t quite the opulent, high-priced machine you might expect from a Hollywood celebrity. No, Matt LeBlanc’s new daily driver is none other than the new 2016 Ford Focus RS. The news was first broken by pro driver Ken Block, who announced LeBlanc’s purchase on Instagram last week. Block has made more than one appearance on the BBC’s Top Gear himself, and he served as a consultant during development of the new Ford Focus RS. As a matter of fact, we have to believe that Block may have been a driving force behind the Focus RS’ revolutionary “Drift” mode. The all-new Ford Focus RS is the first RS-badged model to be sold in the United States, which just began shipping out to customers earlier this summer. It’s powered by a 350-horsepower, 2.3-liter EcoBoost engine, and boasts an advanced all-wheel drive system with electronic torque-vectoring.